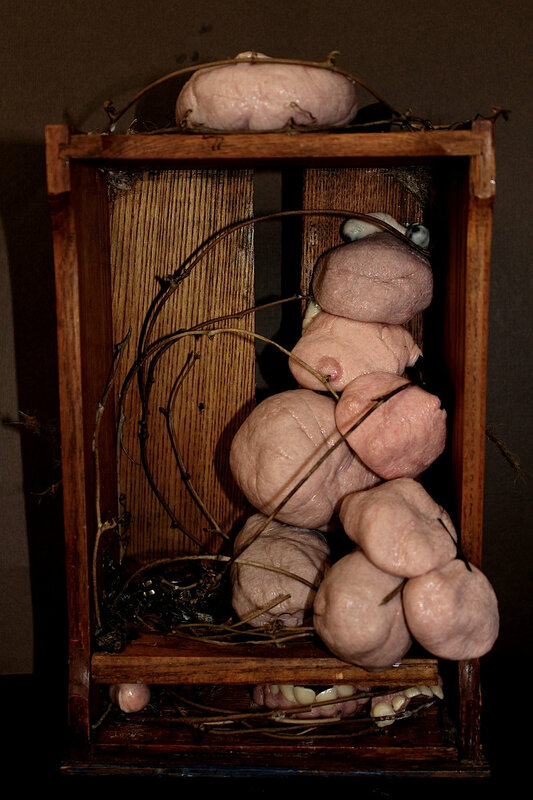 Russel Cameron‘s sculptures are blobby pieces of flesh that are simultaneously wrong and alive-looking. When someone talks about eating vat-grown protein, I imagine that this is what it really looks like before it’s ground up and texturized. Lovecraft would have gotten great enjoyment from this stuff. It’s polymer clay, but my mind imagines that it’s squishy. And if you squeeze it, it makes mewling noises. Then there’s Evan Campbell. 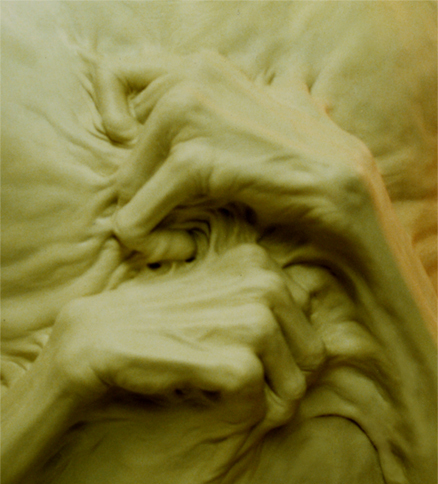 I stumbled across his work years ago; he does sculpting for special effects. 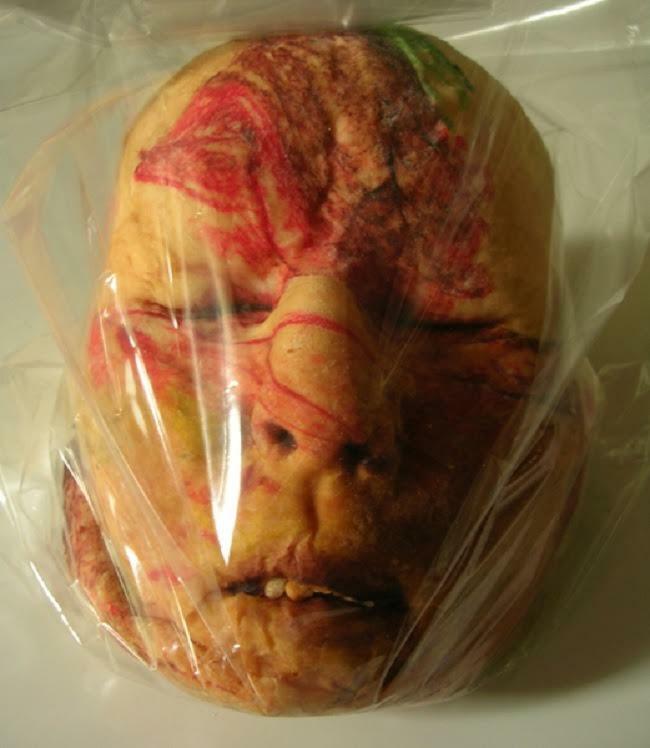 Elsewhere in his gallery, the gelatine head is presented un-painted. It’s amazing what a good paint-job will do to sell the realism and texture of a sculpture. This surfaces all my inner fears of crippling damage, arthritic joints, muscle spasms, broken bones that make things draw up and become very painful. A few years ago I broke my jaw and had to walk around for a couple of days with the bottom taped up (so it wouldn’t swing and grind) without painkillers (I didn’t want them to mask infection if the CSF leaking from my ear turned out to be a portal for infection) – when I see Campbell’s sculpture above, I feel the grinding of bone on bone where cartilage has failed. Those of us getting older all feel that, every morning, when it’s time to get out of bed and we have to negotiate with our various joints to see if we’re going to get to do anything that day. 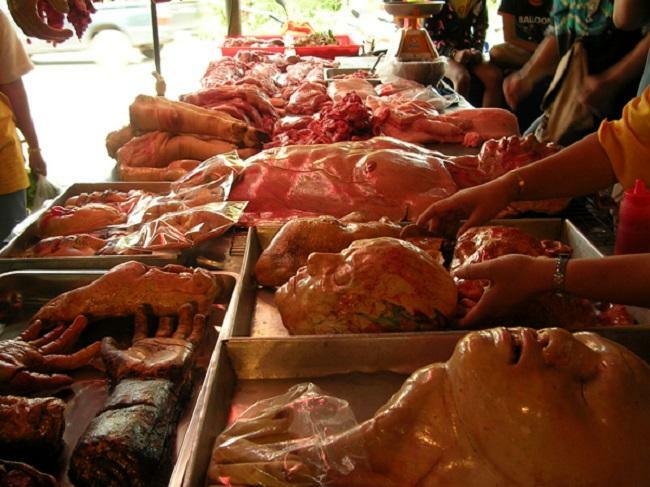 In Thailand there is a bakery that specializes in bread as body parts. I’m surprised this cannibalism by proxy hasn’t caught on in the US. I do not want my bagel to look like that, even if it’s covered in butter. Memento Mori – reminders that we are flesh, and will fail as flesh does. Perhaps it’s a form of antidote to Kurzweilian nonsense about immortality through uploading. Wouldn’t we miss being incarnated in all that yummy squishy flesh? 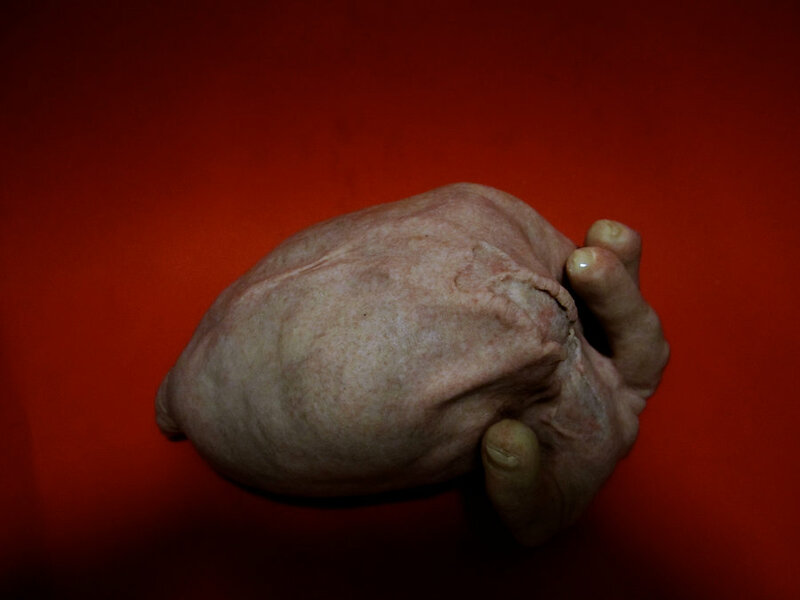 I really like the 3rd of Cameron’s work (the heart), that’s filled with so much, and it’s terribly poignant. I like the 2nd of Campbell’s work a great deal, too. Old age isn’t for the faint of heart. Oh, that bakery. I still don’t like any of it, it all creeps me out, and that’s rare for me when it comes to art. Usually, I’m quite attracted to the creepy stuff, but not that. There’s a terrifying realism to it all, and I wouldn’t be able to eat it. Okay, if I was starving, yeah. The way the bread is glazed reminds me of those anatomical Venus models. It’s all in the uncanny valley for me. Whoah, that is creepy! I think some of his smaller pieces are more powerful than the bad bad boy one, but they’re all cool. PS – you’d pooched the href= in your second link so I edited one in. Hope that’s OK. I have a hyperactive imagination and (when taken off guard) I can be very empathic – when I see stuff that is simultaneously creepy and emotionally striking, I often leap to imagining horrible “what ifs” and have been known to spike my adrenaline and pass out. So, when I look at something like the bakery, my brain quickly flips the “not real” lever or I’d be on the floor. An technical edit that’s announced is good. Thanks. Though, the link I didn’t put there was this one. Yes, its great art and I’m glad it exists. But not the kind of art I would rest their eyes on. Owning a piece would require building or finding a museum for it. Quite remarkable, quite macabre; I for one would most certainly check before chomping on that bread! 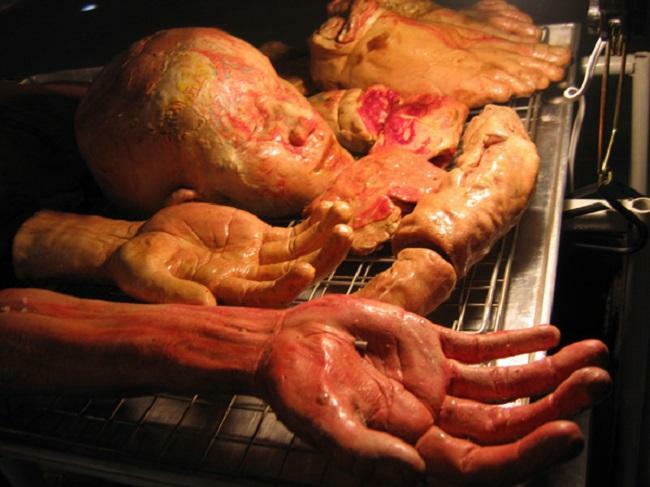 Wouldn’t we miss being incarnated in all that yummy squishy flesh? Heh. I am quite familiar with the etymology of “incarnated” (it helps that my natal tongue is Spanish) — not that I indulge in the etymological fallacy. The sentiment is dualistic, alas. I am not a resident within my flesh, because I am not essentially a mind; rather, what I am is my flesh. The concept of the homunculus within is (at best) otiose — but I suppose it makes some sort of poetic sense. Um, to make my point clearer, when I read “incarnated in flesh”, I also read something like its transliteration were it a foreign word: “enfleshed in flesh” — which is a bit of a “duh”; how else could one be enfleshed? The anatomical venuses are amaaaaazing!!! 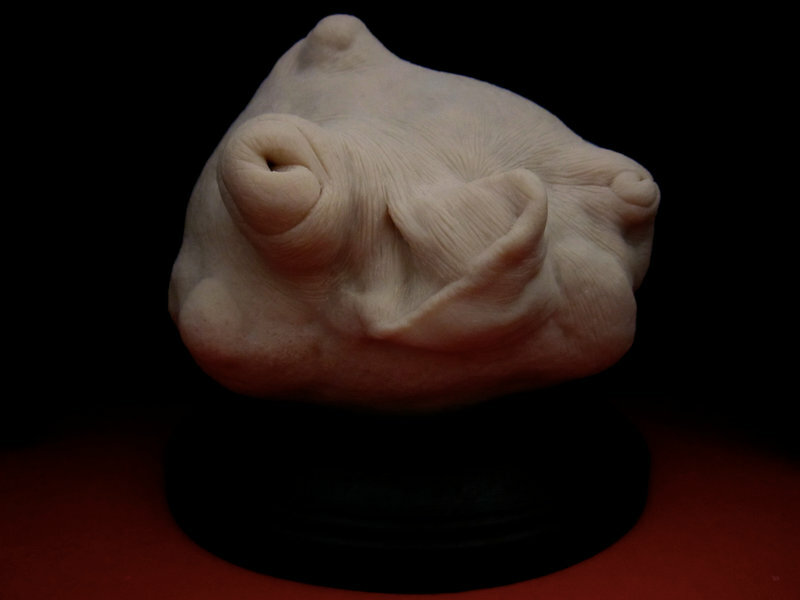 When I first saw one, I immediately wanted to make one but I don’t have anything like the sculpting skills to do it right. From the look of it, they did silicone molds from various models (hopefully they used platinum cure silicone, not tin…) the face on the head/torso near the camera in the 3rd picture from the bottom looks like a rescuscitation/artificial respiration doll. I wonder if they cook the bread in the mold (silicone molds can handle 400degrees, bread is usually done at 375) or what. I am not a resident within my flesh, because I am not essentially a mind; rather, what I am is my flesh. It appears that you are. I’m not even sure what “flesh” means – literally it’s the meaty bits, not the bony bits, but Shakespeare uses it broadly, “This too too sullied/solid flesh” and if it’s good enough for Shakespeare it’s out of my league. Ugh. Reminds me too much of the Cenobites and victims in a favorite/hated movie series/novel: Hellraiser.